This is a review of Hobby Lobby Wax Melts from July 2018. 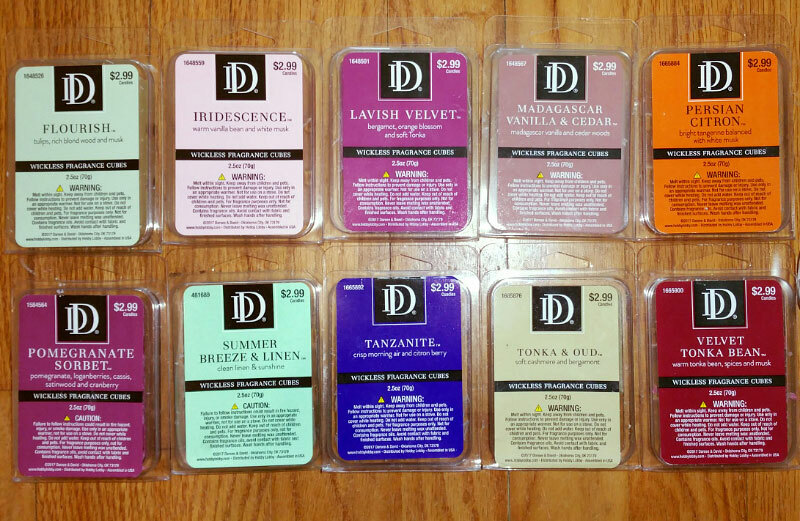 Most of the scents in this review have warm, perfumey notes, and they're fantastic. This smells like an expensive women's perfume with a hint of warm amber and a little bit of a gardenia note. Very nice! This is a pink sugar type scent (a sweet sugary perfumey scent with hints of raspberry), but it's more rich and warm, with an ambery almost slightly smoky note, not as perfumey, and only a barely detectable smidgen of raspberry (not as much as in most pink sugar scents). This one is really hard to describe. I smell notes of apple, wood, floral, cologne, pine, berry, vanilla, and even a hint of marshmallow, but not necessarily in that order, and all the notes are very subtle, with not one note standing out above the others. It's a very complex scent. I like it though. After a few hours it took on a bit more of the apple blossom vanilla marshmallow note, and I don't smell as much of the wood, pine and cologne notes (not that they were strong to begin with). A nice strong cedar scent with a sweet very slightly perfumey note (although this is not a perfume scent), and maybe a hint of patchouli. It also has a note that's not really sour, but more "pungent", that I don't care for. I just realized that this is an almost exact dupe of AmbiEscents Sophisticated Spice. This reminds me a little of Yankee Honey Clementine. It smells like strong tea with a lot of honey, a little bit of a fruity almost candy-like orangey note, and maybe a smidgen of lemon. But it's not a citrusy scent. I don't smell musk or any perfumey notes at all, although it's a little sweet but also very rich. It's a difficult scent to describe. I don't care for it on cold sniff, but I like it when melted. A rich dark berry scent. It's just a little sweet. I smell the tanginess of the cranberry, and a hint of zestiness like a smidgen of lemon that gives it a tiny bit of a tropical note. This is actually an older scent but I never bought it because I didn't like it on cold sniff, and I don't care for it when melted either. It's a fresh scent with maybe a bit of an herbal note, and possibly a smidgen of lemon. It's not sweet at all, actually kind of bitter, and has a little bit of an industrial cleaner note. It doesn't smell like linen or laundry at all. However, after about an hour that "industrial" note dissipated and it started to smell like green grass, so I kind of liked it after that! This is very weak on cold sniff, but it smells like a fresh air, watery scent with a hint of a berry note and maybe a barely detectable smidgen of orange. Melted, however, it's kind of a perfumey vanilla scent with a hint of berry. The warm, sweet, velvety cashmere is the main note, but I also smell a little bit of a rich cologne note (the bergamot) and even a hint of baby powder. Oud is a damp intense woodsy scent with tree sap and cedar notes, and I think I do smell as well, but it's subtle. I really like this scent. This is definitely a winter scent! I smell a strong combination of cedar and pine, with a little bit of a raw woodsy note, and a smidgen of bergamot or warm amber or even a barely detectable cologne note, although it's definitely not a cologne scent. It has the crispness of pine and a little bit of the warmth of amber. I adore this scent and it's crazy strong on cold sniff.